Volvo Ocean Race 2011-12 fourth leg to Auckland kicks off on Sunday. Team Telefónica have withdrawn from Thursday’s practice race after deciding to swap out their rigging before the start of leg 4 as a precaution. Skipper Iker Martínez said the team were being cautious because of the forecast and the fact that two boats lost their masts during leg 1. A crane rolled into place to temporarily remove Telefónica’s mast at about midday local time on Thursday. The entire operation including removing the mast, changing the rigging and stepping the replacement gear was due to be complete by mid afternoon. ‘We want to be super safe,’ said the skipper. ‘We found something that we didn’t like much so we’ve decided to replace the rigging for the next leg, and we have a spare rig here that we’ve used already and we’re very confident with. ‘We’re probably a little bit too sensitive with this but after two masts were broken during this race we’re going to take the mast down, change the rigging and put the mast up again. Martínez explained that the rig had failed return to its typical tensions since the mast was stepped after a full service by the shore crew last week. The Spanish Olympic gold medallist said the team were yet to pin down exactly what the problem was, but he hoped they would have more insight by tomorrow. ‘We do not know much just that something is not looking very well, I cannot tell you much more about the technical things, probably tomorrow we will know much more,’’ he said. 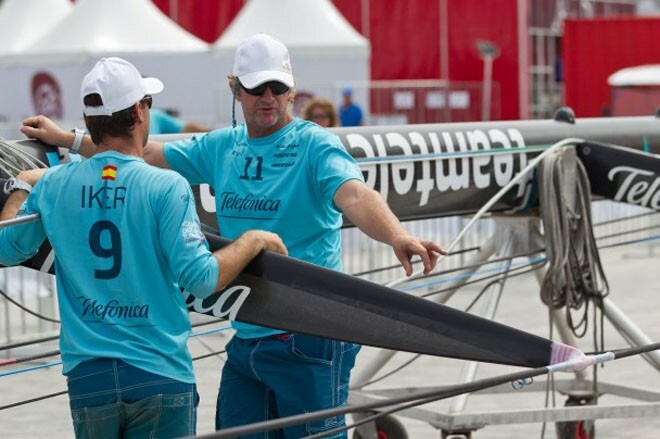 Martínez said he wasn’t too fussed about his team missing an opportunity to practice against the five other Volvo Open 70s. The skipper said he was confident that the training his team had put in over the weekend was enough to help them perform the way they did when they won the in-port race in Cape Town. ‘It’s always good to train, obviously that’s nice for us, but yesterday we trained a little bit and I’m hopeful it’s not going to be bad for us for the in-port race,’’ he said. A lack of breeze forced race management to abandon the practice race in Sanya bay. The five teams managed to complete the two starting sequences before the wind died once the race started. Telefónica will take part in Friday’s Pro-Am races ahead of the Sanya Haitang Bay In-Port Race on Saturday and the start of leg four to Auckland on Sunday.